Learn the official language of Cambodia on our Khmer Language Course. Khmer is the second most widely spoken language in continental southeast Asia, and 16 million people speak it across many countries including Thailand and Vietnam. Learning a local language is a wonderful way to get to know a country and its people and cultures. 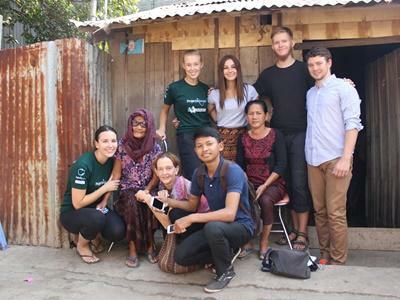 It will help you gain deeper insight into the local community where you are placed in Phnom Penh, from the host family you live with to interacting with people in public. If you take the Khmer Language Course while participating on another project, your new language skills with help you communicate more effectively with those you interact with at your placement, making your time more effective and rewarding. You will have a private tutor who will give you lessons on the Khmer Language Course. Together, you will decide on the structure of your lessons and work out an outline of each tutoring session based on your interests, what topics you want to cover, and your current language level. On arrival in Cambodia, after you’ve settled in and met the Projects Abroad Cambodia staff, you’ll be introduced to your language tutor. During your weekends and free time in Cambodia, you can explore the ancient temples near Siem Reap, relax on the beach in Sihanoukville, eat traditional Khmer curry with rice noodles, and practice your Khmer with the people you meet. If you are not doing a standalone language course, you can also undertake a short 5-hour, 14-hour, or 30-hour language course in Khmer. This course runs alongside your main volunteer project or internship. If you are planning on volunteering abroad for twelve weeks or more, you could also complete a 60-hour course alongside your project. For more information please visit our Language Add-ons page.